Richard Darwin Keynes (Born 14 Aug 1919). British physiologist who did pioneering work on the mechanisms underlying the conduction of the action potential along nerve fibres. Early in his career, he worked with the giant nerve fibers of squid, which would help discover how nerve impulses are transmitted in all animals. In later resarch, he determined how electric eels project electric fields outside their bodies. Keynes was the first to use radioactive sodium and potassium tracer atoms to follow the movements of these atoms when an impulse is transmitted along a nerve fibre. He has written extensively about the life and work of his great-grandfather, Charles Darwin, beginning with The Beagle Record (1979). Paul Bartsch (Born 14 Aug 1871; died 24 Apr 1960). German-American zoologist who was an authority on molluscs, but had broad interests in natural history including plants and birds. He began his career as assistant curator of marine invertebrates at the US National Museum, Washington, DC., but then worked until retirement for the Smithsonian Institution (1896-1942). He represented that organisation on numerous zoological expeditions. In 1902, he initiated a systematic, scientific bird banding program (credited as the first in North America since John James Audubon) by banding 23 Black-crowned Night-herons at Washington, DC. During WW I, he invented a gas detector for the Chemical Warfare Service in 1918. Bartsch organized the first Boy Scout troop in Washington. Ernest Thompson Seton (Born 14 Aug 1860; died 23 Oct 1946). Anglo-American naturalist, writer and illustrator who applied these skills in over forty books on wild life, woodcraft, Indian lore and animal-fiction stories. As a capable naturalist, in his field observations he made detailed studies of morphology, physiology, distribution, and behaviour. His fame as author began with Wild Animals I Have Known (1898) – still in print a century later. Over a period of twenty years he delivered over three thousand lectures. Believing in promoting the values of ethology and ecology, he was chairman of the committee that established the Boy Scouts in the U.S. (1910). Seton envisioned the North American Indian as a model for the movement, but Baden-Powell’s military structure was adopted as in Britain. Frederic Ward Putnam (Died 14 Aug 1915; born 16 Apr 1839). American archeologist, naturalist and museum administrator who played a major role in the popularization of anthropology, its acceptance as a university study, and instigated more anthropological museums. After entering Harvard College as a student (1856), he was much influenced by Louis Agassiz. As Curator of the Peabody Museum (1875-1909), Putnam organized numerous pioneering expeditions in Southwest and Central American archeology. As director of the anthropological section of the World’s Columbian Exposition in Chicago (1891-93), he mounted an impressive exhibit. 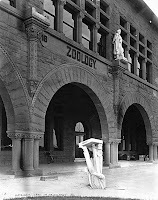 It created wide-spread interest in anthropology, and subsequently became the nucleus of the great collections of the Field Museum in Chicago. Richard Jefferies (Died 14 Aug 1887; born 6 Nov 1848). (John) Richard Jefferies, born near Swindon was a naturalist, novelist, and essayist. He began his literary career as a local reporter in Wiltshire, and from then on he wrote many works of natural history and country life, and essays in journals and magazines. Jefferies relied greatly on ‘field notebooks’, where he entered his meticulous observations on the life of the countryside. Wild Life in a Southern Country, in which the author, sitting on a Wiltshire down, observes in ever widening circles the fields, woods, animals, and human inhabitants below him, was published with success in 1879. He wrote his autobiography, Story of My Heart (1883). His vision was unappreciated in his own Victorian age but has been increasingly recognized and admired since his death. Louis Agassiz (Born 28 May 1807; died 14 Dec 1873). (Jean) Louis (Rodolphe) Agassiz was a Swiss-born U.S. naturalist, geologist, and teacher who made revolutionary contributions to the study of natural science with landmark work on glacier activity and extinct fishes. Agassiz began his work in Europe, having studied at the University of Munich and then as chair in natural history in Neuchatel in Switzerland. While there he published his landmark multi-volume description and classification of fossil fish. In 1846 Agassiz came to the U.S. to lecture before Boston’s Lowell Institute. Offered a professorship of Zoology and Geology at Harvard in 1848, he decided to stay, becoming a citizen in 1861. His innovative teaching methods altered the character of natural science education in the U.S.
John Lubbock (Died 28 May 1913; born 30 Apr 1834). 1st Baron Avebury. English banker, politician, naturalist and archaeologist who coined the terms Neolithic and Paleolithic. Like his father, astronomer Sir John William Lubbock, his scientific work was an avocation. Lubbock was a friend and advocate of Charles Darwin. He discovered the first fossil remains of musk-ox in England (1855), and undertook archaeological work identifying prehistoric cultures. As a naturalist, he studied insect vision and colour sense. He published a number of books on natural history and primitive man. In 1870, he became a member of Parliament. The legislation he initiated included the Bank Holidays Act (1871) and the Ancient Monuments Act (1882) and the Shop Hours Act (1886). He was made a peer in 1900. Sir Edwin Ray Lankester (Born 15 May 1847; died 15 Aug 1929). British zoologist whose interests embraced comparative anatomy, protozoology, parasitology, embryology and anthropology. He was one of the first to describe protozoan parasites found in the blood of vertebrates. Lankestrella (a parasite related to the causative agent of malaria) carries his name. His work contributed to an understanding of the disease. Based on his investigation into the comparative anatomy of the embryology of invertebrates, Lankester endorsed Darwin’s theory of evolution. In anthrolopology, his activities included the discovery of flint implements, evidence of early man, within Pliocene sediments, in Suffolk. He was Director of the British Museum of Natural History (1898-1907). (Alexandre-)Henri Mouhot (Born 15 May 1826; died 10 Nov 1861). (Alexandre-)Henri Mouhot was a French naturalist and explorer of the interior of Siam, Cambodia and Laos (1858-61), he is remembered for his reports of the ruins of Angkor, capital of the ancient Khmer civilization of Cambodia. The location was known to the local population, had been visited by several westerners since the 16th century, but it was Mouhot’s evocative accounts and detailed sketches that popularized the Angkor series of sites with the western public. He drew the attention of western scholars to the many ancient terraces, pools, moated cities, palaces and temples as important archaeological sites. His books were published posthumously as he died in Laos at the young age of 35 from malarial fever on his fourth jungle expedition. A small box of animal bones, forwarded by Charles Darwin from North Wales, led to excavations by William Boyd Dawkins in Denbighshire between 1869 and 1872 and in Flintshire in 1886. Neglected riches of the archival record allow glimpses of Darwin and his family and contribute to this first narrative account of a pioneering episode in prehistoric archaeology which resulted in the three most important discoveries of Neolithic human remains in North Wales (and their later apparently near total disappearance). Many of the leg bones had features of the flattening of tibia (platycnemia) and femur (platymeria) first noted by George Busk in Neolithic bones from Gibraltar in 1863, and by Paul Broca at Cro-Magnon in 1868. Within a few years flattened leg bones were recognised across the globe, subsequently in samples extending back to the Middle Palaeolithic and forward to modern hunter-gatherers; platymeric shafts have been found at early hominin sites. Busk’s platycnemic index and understanding of flattening as related to muscular activity anticipate the work of modern bioarchaeologists. Dawkins was recipient of a much quoted account of the Huxley-Wilberforce confrontation at Oxford and opponent of Darwin’s views on human origins: his work opens up instructive perspectives.